Endless Horizons is inspired by Johannes Kepler’s book Mysterium Cosmographicum, in which the famous astronomer details the geometrical model of the universe. In his sketch, the six known planets at the time, from Mercury to Saturn, are nested within each other, where the space between them is successively occupied by the five polyhedra mathematically closest to the sphere. The installation suggests another reading of this modelization of the universe using regular polyhedra. 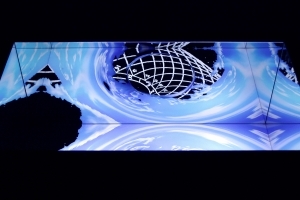 Surrounded by mirrors, a horizontal screen displays the “planets” in motion, which viewers are led to explore as they move through them. They are invited to embark on an infinite journey into the dimensions of space and time. Here, space is incommensurable, and the image reflected in the mirrors is projected into infinity, abolishing the notion of horizon. The endless time of a journey through multiple worlds loops back into itself and imposes the model of eternal return to the same point. The 256 shapes of the film Digital Vocabulary were captured in motion, each defined by a distinct algorithm that allowed them to be 3D printed. The virtual becomes real and is incarnated in shapes. This transformation from digital to solid state is made possible by translating digital forms into a program where these elements can be edited. They are then laid out in a row on a lit table, according to the organization of the original plates in Woody Vasulka’s Digital Vocabulary. SLIDERS_lab is an artist collective founded in 2005. It considers an esthetic territory emerging around animated images, archives and digital media. This approach currently extends to contemporary forms of representations and navigations within audiovisual collections. Composer and visual artist Frédéric Curien works at the intersection between music and visual arts on interactive soundscapes. 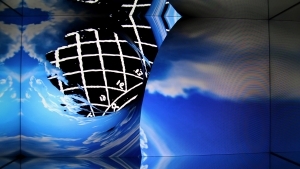 Jean-Marie Dallet, artist, exhibition curator and research professor at Paris 8 University, has exhibited his works and his research internationally, questioning the notion of interactivity and the figures responsible for this interaction. 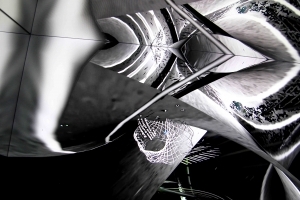 Artist and developer Hervé Jolly is in charge of SLIDERS_lab’s interstellar programs.